8 a-e-mag.com • A&E MARCH 2018 I love to compare sublima- tion decorating to the sci- ence of electricity. As every day passes, we have many new inventions that are powered by electricity that just a few years ago would have been considered something from a science fiction film. If you went back in time, I doubt many folks could imagine how things would turn out. 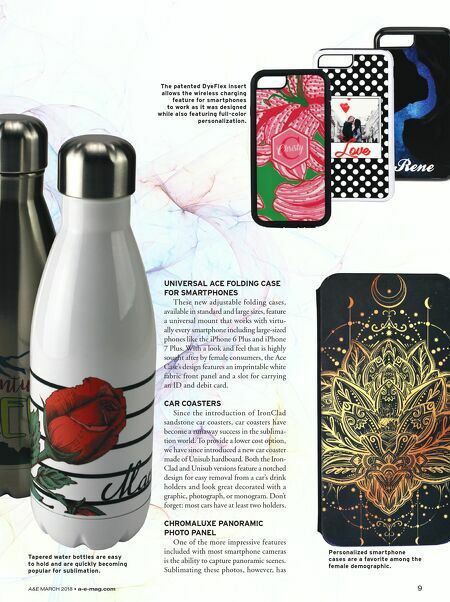 Sublimation technology continues along a similar path of exciting new developments that help produce thousands of great personalized products. 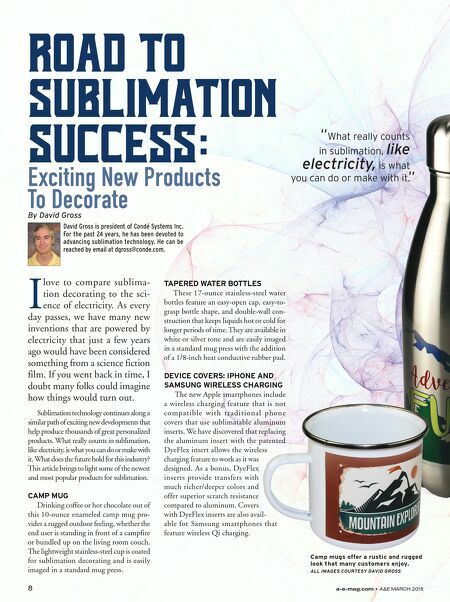 What really counts in sublimation, like electricity, is what you can do or make with it. What does the future hold for this industry? This article brings to light some of the newest and most popular products for sublimation. CAMP MUG Drinking coffee or hot chocolate out of this 10-ounce enameled camp mug pro- vides a rugged outdoor feeling, whether the end user is standing in front of a campfire or bundled up on the living room couch. The lightweight stainless-steel cup is coated for sublimation decorating and is easily imaged in a standard mug press. TAPERED WATER BOTTLES These 17-ounce stainless-steel water bottles feature an easy-open cap, easy-to- grasp bottle shape, and double-wall con- struction that keeps liquids hot or cold for longer periods of time. They are available in white or silver tone and are easily imaged in a standard mug press with the addition of a 1/8-inch heat conductive rubber pad. DEVICE COVERS: IPHONE AND SAMSUNG WIRELESS CHARGING The new Apple smartphones include a wireless charging feature that is not compatible with traditional phone covers that use sublimatable aluminum inserts. We have discovered that replacing the aluminum insert with the patented DyeFlex insert allows the wireless charging feature to work as it was designed. As a bonus, DyeFlex inserts provide transfers with much richer/deeper colors and offer superior scratch resistance compared to aluminum. Covers with DyeFlex inserts are also avail- able for Samsung smartphones that feature wireless Qi charging. By David Gross road to sublimation success : David Gross is president of Condé Systems Inc. For the past 24 years, he has been devoted to advancing sublimation technology. He can be reached by email at dgross@conde.com. Exciting New Products To Decorate Camp mugs offer a rustic and rugged look that many customers enjoy. ALL IMAGES COURTESY DAVID GROSS "What really counts in sublimation, like electricity, is what you can do or make with it. "